Dr. Niraj Shah provides all types of retinal surgery and management of vitreoretinal disease as part of the region’s only comprehensive eye care practice. Dr Shah explained the procedure very well and was very professional. Excellent care given. I trust him completely. Dr Shah is professional without being condescending. He explains things in a way that makes it easy to understand the problem. I trust him. He answers my questions so I can understand. He treats me with respect and has been very thorough with my treatments. I would recommend him to any of my friends and family. Not very talkative but a good doctor and I trust him. He is a good doctor. but the nurse that mesures the pressure in my eyes did not wear the gloves... After few minutes she was aware of this and she wore the gloves and mesured my presure again. Simply the best. I have every confidence in Dr. Shah. Dr. Niraj Shah provides all types of retinal surgery and management of vitreoretinal disease as part of the region’s only comprehensive eye care practice. He works collaboratively with your other eye doctors. 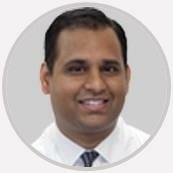 Dr. Shah is a graduate of The University of Toledo College of Medicine. He completed his Ophthalmology training at Eastern Virginia Medical School and his Vitreoretinal fellowship at the Ohio State University Havener Eye Institute.